What are your philosophies and beliefs about birth? I prefer to focus on the outcome rather than the process – in the end, everybody wants a healthy and happy mother and baby. If this can be achieved with a minimal of intervention, so much the better. However, I think that some women set themselves up for disappointment by putting too much emphasis on “natural” childbirth. How much choice do you feel I should have in the decision-making process for my birth? It is your body, so all decisions are ultimately up to you. I am happy to accommodate your choices as long as they are safe. As a professional, I am obliged to tell you what I think to be the best choice. There are rare emergency situations that demand immediate action rather than discussion. What are your thoughts on pain relief during labour? Especially in your first labour, it is hard for you to anticipate how you will react to pain in labour. In the 21st century, it is unacceptable for any woman to suffer pain that can be safely alleviated unless that is her choice. Having said that, you are free to choose the method of pain relief that you think suits you best, but you should be willing to change your mind if you do not find your choice effective. This is a useful link to some information about different methods of pain relief. Is there anything on my birth plan that you aren't comfortable with or that you foresee will be a problem at my chosen hospital? This depends what is in your plan – it is rare in my experience to find a reasonable request that cannot be accommodated. Of the 3 hospitals listed above, only Frances Perry has baths in labour ward, so labouring in water is not possible at any other hospital. What are your thoughts on electronic monitoring and when do you think it should be used? Continuous electronic fetal monitoring has been shown to reduce the risk of seizures in the newborn in low-risk women, at the “price” of an increase in Caesarean sections. Continuous monitoring has become the standard of care in women with any risk factors in labour –click here to see the guidelines of the Royal Australian and New Zealand College of Obstetricians and Gynaecologists. The most common reasons that I will recommend continuous fetal monitoring are the meconium-stained liquor, epidural and the use of oxytocin to augment or induce labour. What is your induction rate and at what point do you feel induction of labour should be considered? My rate of booking induction of labour is about 10%, but about half of these women end up going into spontaneous labour before the booked date, so my actual induction rate is about 5%. I will discuss induction of labour when the risk to the baby and/or mother of continued pregnancy is higher than the risk of delivery, including the risk of the method used to induce labour. The most common reason is when the pregnancy has gone more than 41 weeks. There is clear evidence that in this circumstance, the chance of the baby dying before birth is significantly less (about 1/3,000 versus 1/300) if labour is induced rather than waiting. However, the absolute risk is small, and it remains the mother’s decision. 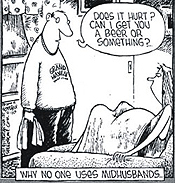 Many women prefer to have labour induced in any case. Other reasons I might suggest induction of labour include spontaneous rupture of the membranes (especially if you carry Group B strep) and diabetes in pregnancy (including gestational diabetes). What is your caesarean section rate and in what situations will you recommend a caesarean section? A wise obstetrician was quoted as saying "I'm very worried about the Caesarean section rate. I just don't know whether it is too high or too low." There is no correct Caesarean section rate. My overall Caesarean section rate is 26%. Of these, 63% are elective procedures (women not in labour). My emergency Caesarean section rate (that is for women who go into labour) is 12%. By comparison, the overall rate for Victoria is over 30%. The most common indication for Caesarean section is in women who have had a previous Caesarean section and either would prefer to have an elective Caesarean section, or who have a contraindication to vaginal birth after Caesarean section (VBAC). Other reasons I might suggest elective Caesarean section include breech presentation or if the placenta is covering the cervix (placenta praevia ). The major indications for emergency Caesarean section (Caesarean section in labour) are lack of progress in labour and concerns about fetal wellbeing – “fetal distress”. How do you feel about mothers being separated from their babies after a Caesarean? What about immediate skin to skin contact if all are well? I have no problems with this as long as the paediatrician is happy. My episiotomy rate for women having vaginal births is 6%. Of these, the vast majority are for women having an assisted vaginal delivery, either vacuum or forceps. You may be able to reduce the risk of tears and episiotomy by pelvic floor massage towards the end of pregnancy (click here for instructions), or the use of the EpiNo device. How do you feel about vaginal breech birth? If you support it, what conditions do you have? High-level evidence in the Cochrane Library shows that planned vaginal breech delivery is associated with a higher chance of the baby dying in labour or being seriously ill soon after birth than if delivered by planned Caesarean section. Because of this, most learned bodies have recommended that the preferred option in a woman with a breech presentation at term is to perform a Caesarean section. In women who were planned to have a vaginal delivery, the risk of the baby dying in countries like Australia is about 0.6%, with a risk of serious illness in the baby of about 5%. About 45% of the women planned to have a vaginal delivery ended up with a Caesarean section. For a woman with suspected breech presentation, pre- or early labour ultrasound should be performed to assess type of breech presentation, fetal growth and estimated weight, and attitude of fetal head. If ultrasound is not available, Caesarean section is recommended. Vaginal breech delivery can be offered when the estimated fetal weight is between 2500g and 4000 g.
Clinical pelvic examination should be performed to rule out pathological pelvic contraction. Radiologic pelvimetry is not necessary for a safe trial of labour; good progress in labour is the best indicator of adequate fetal-pelvic proportions). Continuous electronic fetal heart monitoring is preferable in the first stage and mandatory in the second stage of labour. When membranes rupture, immediate vaginal examination is recommended to rule out prolapsed cord. In the absence of adequate progress in labour, Caesarean section is advised. A passive second stage without active pushing may last up to 90 minutes, allowing the breech to descend well into the pelvis. Once active pushing commences, if delivery is not imminent after 60 minutes, Caesarean section is recommended. The active second stage of labour should take place in or near an operating room with equipment and personnel available to perform a timely Caesarean section if necessary. A health care professional skilled in neonatal resuscitation should be in attendance at the time of delivery. How do you manage the third stage? The World Health Organization has recommended that all women should be offered active management of the third stage of labour (the delivery of the placenta). “Active management of the third stage of labour prevents postpartum haemorrhage by over 60% and therefore should be offered by all skilled birth attendants at every childbirth.” Active management of the third stage involves administration by injection of a drug to help the uterus contract immediately after the baby is born, then clamping of the umbilical cord once the uterus contracts (usually 1-2 minutes) and controlled traction on the cord to deliver the placenta. This reduces the chance of losing more than 500 mL of blood from about 15% to 5%.